Sapphires and rubies have long been associated with power and nobility. The intensity of their colours makes them highly coveted as two of the four major precious gemstones, in the company of Diamonds and Emeralds. This guide to Sapphires and Rubies will educate you on their commonalities, their key differences, their importance throughout time and cultures, and the facts to consider when buying and maintaining Sapphire and Ruby jewellery. Sapphires and Rubies actually share the same mineral species—corundum. In its purest state, corundum is colourless. It is only through the presence of impurities that produces colour in the mineral. 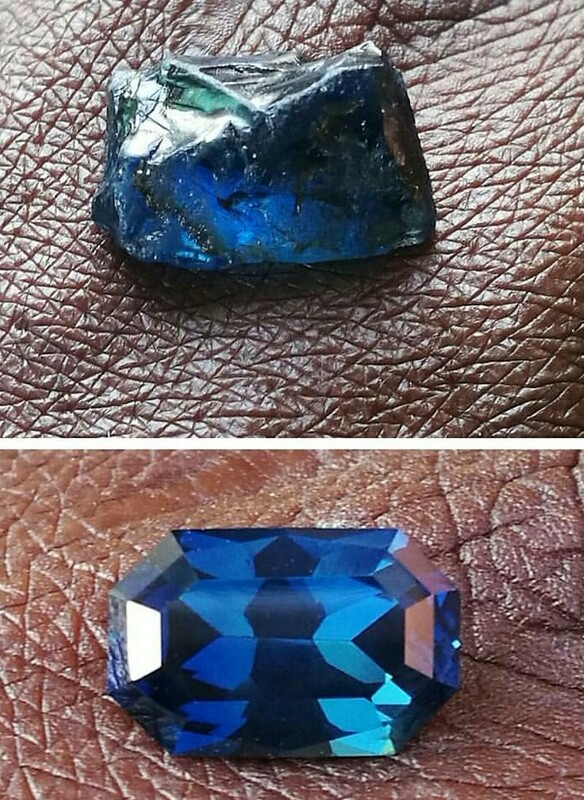 Before and after a Sapphire gemstone is cut. Trace amounts of iron and titanium are what transform corundum into the gemstone known as Sapphire. Depending on the levels of iron and titanium in the corundum, Sapphires can have a wide range of colours, although of course blue is the colour Sapphires are most famous for. There are what the gemstone industry calls “fancy Sapphires”, which cover Sapphires that are coloured violet, green, orange, pink, grey, black, brown, and every hue in between. “Particoloured Sapphires” can simultaneously have multiple colours. There are even colour-changing sapphires that reflect blue in sunlight and fluorescent lighting but show as purple in incandescent lighting. A Padparadscha sapphire, one of the most expensive and rarest sapphires in the world. A rare type of sapphire that commands a hefty price is the Padparadscha Sapphire, which exhibits a pinkish-orange colour. The presence of chromium in corundum injects the colour red into the mineral, turning it into a Ruby. The more chromium there is, the deeper the red is in the Ruby. There are also various shades of red that Ruby can have, from pinkish to orangey to purplish. Rubies formed in marble can glow in ultraviolet light. Rubies are considered one of the most valuable coloured gemstones, with their per-carat price often exceeding Sapphires and Emeralds. Both Sapphires and Rubies have a Mohs rating of 9. Their hardness only comes second to Diamond, which have a 10 out of 10 Mohs rating. This makes both gemstones extremely scratch-resistant. Natural Sapphires and Rubies have inclusions, which are the fissures that can be seen inside the stones. When these inclusions look like three or six-point stars, this phenomenon is called “asterism”. Sapphires and Rubies that display this attribute are called “Star Sapphires” and “Star Rubies”, and such rare forms are highly prized. Sri Lanka was a significant source of Sapphires in the ancient world, and its mines are still being extracted for the gemstone in the modern age. The Kashmir region of India used to be known for its Sapphires, giving rise to the Kashmir Sapphire known for its intense purplish-blue hue and silky inclusions, but the location has since greatly been reduced of its Sapphire output. Other major sources today are Thailand, Cambodia, Myanmar, Australia, and Montana in the US. The gem mines of Mogok, Myanmar. Myanmar is the premier source of rubies in the world, particularly the Mogok and Möng Hsu regions that boast the finest coloured stones. Thailand’s Chanthaburi Province is another major location in the Ruby trade, producing high clarity Rubies. Madagascar became a prominent provider of rubies in 2000. Kenya, Vietnam, and Afghanistan are also mined for rubies, among other countries. “Sapphire” was derived from the Ancient Greek word “sappheiros”, which was likely used to refer to lapis lazuli, a blue semi-precious stone not to be confused with actual sapphire. Sapphires were associated with bringing harmony between people in the olden days. Royalty believed it protected them from envy and infidelity. This belief extended to romantic and adversarial relationships, providing peace between two parties. Divinity was attributed to Sapphires as well. Clergymen wore it on their robes, while people who consulted oracles thought sapphires would make it easier to decipher prophecies. The Ten Commandments were supposedly made of Sapphire. Christians of old knew Star Sapphires as Stones of Destiny, using them as talismans to protect them from illness and all manner of devilry. Princess Diana’s and Kate Middleton’s sapphire engagement ring. Perhaps the most well-known Sapphire jewellery in the modern age is Princess Diana’s 18-carat engagement ring she got from Prince Charles, which their son Prince William would, later on, give to Kate Middleton for their engagement. Ruby, meanwhile, takes its name from the Latin word “ruber”, which translates to red. Like Sapphires, Rubies have a long history with kings and queens and holiness. Societies of the past thought possessing rubies would lead to even more wealth in the form of acquiring more gems. Ruby is “ratnaraj” in Sanskrit, meaning “the king of precious stones”. The Hindus regarded them as valuable offerings to the gods. Give rubies to Krishna, and rebirth as an emperor was guaranteed. Burmese warriors inserted Rubies into their flesh, believing these stones would grant them invincibility in battle. They made a connection between Rubies’ colour and the life-sustaining power of blood. Elizabeth Taylor’s £87.7 million ruby and diamond necklace. Today, the Ruby is a symbol of passion and success. Elizabeth Taylor’s Ruby jewellery arguably has garnered the most attention in popular culture, with her signature Ruby and Diamond necklace going for £87,749,510 at a Christie’s auction in 2011. The most important factor by which coloured gemstones are judged is, unsurprisingly, their colour. Sapphires and Rubies are no exceptions. Hue, tone, and saturation are the colour subcategories that determine value. 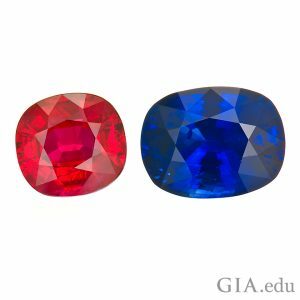 The closer to pure blue (cornflower blue) for Sapphires and pure red (pigeon blood red) for Rubies in terms of hue, the pricier it is. Tone refers to the darkness or lightness of the colour, and a medium to dark tone is preferred for both stones. Deeply saturated colours make for more valuable rubies and sapphires as well. Since inclusions are natural in Sapphires and Rubies, they often undergo heat treatment to lessen such flaws. Clarity is considered in pricing, and only the naked eye is required to judge for that metric. However, credible sellers should disclose whether or not their Sapphire and Ruby jewellery has undergone such treatment. The cut of a Ruby or Sapphire is mostly a matter of preference. As long as it reflects light in a way that enhances the stone’s natural beauty, it should be good. A brilliant cut on the crown and a step cut on the pavilion are common cuts for Rubies and Sapphires. 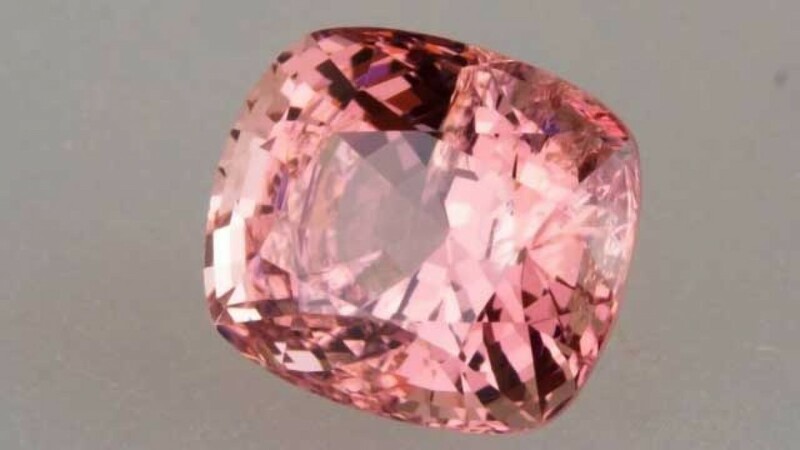 As with all gemstones, the higher the carat, the more expensive the Ruby or Sapphire. Both are heavier than Diamonds, so they will look smaller even when they have the same carat value. Big Rubies generally are more costly than big Sapphires of equal qualities. The hardness of Sapphires and Rubies make them easy to maintain. Ultrasonic jewellery cleaners are fine to use, but hand-cleaning with mild soap and warm water is preferable. They can scratch softer gemstones, so compartmentalise your Ruby and Sapphire jewellery.